Summary outline of most site content. Developed in C, VB, and PHP/MySQL under IIS to create patented web-connected barcoding systems used by major corporations. Created a Windows file conversion program for PalmPilot documents, as well as its e-commerce system and licensing serialization in Perl under Unix. Developed online restaurant reservation system in VB and C under Unix and NT. Developed a major sales contact management product in Visual Basic on Windows networks. Developed in dBase on Windows networks to implement a specialized image leasing system. Developed in Pascal and C under DOS. Created master control programs for device networks. Developed in Pascal and Basic to create educational games for Chicago Museum of Science and Industry, Shedd Aquarium, Adler Planetarium, Lincoln Park Zoo, and Chicago Botanic Gardens. Student and hobbyist since the dawn of microcircuits. "I wish him all the best in the future." Andrew's work appears on the CTA's resources pages. Andrew's work appears on Divvy Bike's resources pages. Finalist in the Metro Chicago Information Center&apos;s data portal contest. Andrew is named on several intellectual properties. Certificate of outstanding contribution for 10+ years. "Thank you for making the difficult easy and the unavailable real!" ChicagoFunNews.com was a "Best of Chicago" readers&apos; polls winner in 2001. ChicagoFunNews.com was a "Best Of The Net" winner in 2000. Glowing review of Getalife software. "Congratulations on getting this in place on a shoestring!" ChicagoFunNews.com was a "Best of Chicago" readers&apos; polls winner in 1999. ChicagoFunNews.com was a "Best of Chicago" readers&apos; polls winner in 1998. "Extremely satisfied with Andrew's job performance... Clearly an outstanding programmer." "patient and knowledgeable ... positive and enthusiastic"
"great satisfaction with your work... available and helpful in the extreme"
"Thanks for saving my business!!" "knowledge and expertise has become something I can rely on"
The company&apos;s first ever "Mr. Congeniality" award for Extreme Patience in Service to Customers. "always been a pleasure ... wish him the very best"
ICCP is THE standard for certification of computer professionals since 1973. Passed with honors in the top 10%! "reliable professional. ... good understanding of high technology equipment ..."
"proved himself to be a highly reliable and responsive individual"
"attention to detail and genuinely cared about the quality ... an asset to any company"
"worked to fix problems promptly and showed real concern"
"one of a few excellent programmers"
"continually demonstrated technical expertise ... responsive to customer ... highly recommend"
Note from a Nobel Prize winner. "greatly appreciate your talents and attitude"
"innate understanding of computers ... able to handle projects of considerable complexity"
Educational computer game was a major component in an award winning museum exhibit at the Chicago Botanic Gardens. "ingenuity and creativity ... thorough knowledge of computers and programming"
InfoWall of at-a-glance weather and webcams. Andrew has developed for an extraordinary variety of mobile devices. Developed in PHP, HTML, CSS under Apache. Developed in HTML and CSS. Archive of basic commercial themes for small web projects. Andrew Bedno's Performance resume: Face Painting and Balloon Twisting. Printable PDF version. Andrew Bedno's Performance resume - Various professional references and certificates of accomplishment. Andrew Bedno's Performance resume - Face Painting samples. Andrew Bedno (aka Drizzle the clown) demonstrates his signature Starship Enterprise advanced single balloon sculpture. Andrew's Automatic Talking Twister Spinner video. Photo and backstory on each. Click a photo to zoom. But those aside there's JUST a few things I dearly want, published here for friends and family gifting advice. Minimum file list for portable media device loading. No mp3s, just insights. Personal Info Wall. At-a-glance time/date, weather/forecast/radar, webcams, more. Ideal for dedicated always-on projector, laptop or tablet. The world's first video game (1962's "Spacewar!") running on a simulation of one of the world's first commercially produced computers (the DEC PDP-1) with touch controls and dynamic sizing added for smartphone play. Uses the actual binary program file transcribed from papertape! Background info on Andrew's art project of creating a "1:30,000 scale working replica" of the world's first video game (1962's "Spacewar!"). running on a simulation of one of the first commercially produced computers (DEC's PDP-1), and subsequent creation of a smartphone version. Web-based version of an iconic toy, speaks weather and more with synchronized animations. Andrew Bedno's pages related to Hamlet. E-Books specially prepared by Andrew for your enjoyment. Analysis suggests "drink" as an optimal word on which to drink. Curated collection of biographical and visual resources for purposes of Steve Jobs costuming and performance. Notes, examples, and videos on the subject of most easily carving terrifying jack-o-lanterns in the visage of Donald Trump. Good links to local movie theaters and some movie review systems. Compendium of Christmas related movies and shorts. Compendium of circus and/or clown related movies. This listing includes only dramatic/comedy/documentary styles, not tutorials. Research on best French romance films. Partly for fun, partly for language study. List of several hundred movies Andrew has seen or plans to watch some day. Automatic map linking and embedding for photos, using extended GPS location info in JPG files. Demonstrated here with GoogleMaps and iPhone photos, but works with other SmartPhones and advanced cameras. Preparation of videos for iPhone/iPod/MP4 playback, using the "ffmpeg" transcoder. Minimum genome and success through simplicity. Sharing for other iPhone/iPod users looking for music app advice, and for fellow music theorists who may like me have been unuaware of what's becoming reality thanks to the unique power and interface. Common Error Codes: DOS, Unix, Cobol, ISAM. Complete dummy's how-to create a first web page guide. This document briefly describes the process of installing Linux from the RedHat 3.0 distribution. Quick Reference to the standard "vi" editor found in *nix OS's. InfoWall : At-a-glance time/date, weather/forecast/radar, webcams, more. Ideal for constant-on projector, netbook or tablet. An illustrated satire of religions' absurdity. Announcing the great merger at long last. Classics from ancient nerd times. So obvious ridiculous, they never imagined we'd take it seriously. Laziness can be a virtue. Massive glossary of humorous hacker terms built through the late 80s. Andrew's project in the 1980s to accumulate and publish a baseline set of classic jokes in common topics. Andrew's project to collect lightbulb jokes. Make one up for your profession. This Product Consists of 99.9999999999% Empty Space. Thou unmuzzled beslubbering toad-spotted beetlehead. When I was young we didn't have cell phones. Jar of rocks story variation. ...before I went out into the real world. Chicago Critical Mass (and similar) route map flyers retrospective. Actual examples of Andrew's work on mobile devices. Recommended World Naked Bike Ride Chicago body painting. Visually zoom from the visible universe down to smallest possible object in 61 decimal places. Mandala "dismantling" at Navy Pier. Artists of the Wall Festival in Rogers Park (since 1994). F.I.R.S.T. Robotics Competition Regionals at UIC Pavilion. "Snow Days" ice carvings at Navy Pier. Active Transportation Alliance's Boulevard Lakefront Tour bike ride. End of April bike stuff. "Kidical Mass" ride from Lincoln Square one cool April Saturday. Annie Warnick teaching Skateboard Art for After School Matters. Various end of March 2010 sights. "End the Wars & Occupations Now!" protest. Pre-spring scenes and bike reflective workshop. Various January 2010 sights. First demo of automatic GPS and datetime tagging. Cirque Du Soleil "Banana Shpeel" at Chicago Theatre. Various late September 2009 sights. Chicago Critical Mass "Water Mass" ride. Glenwood Ave Arts Fest (since 2002) in Rogers Park. The Chain Link anniversary party. Dubi's Air Ride, Tour de Fat, other big biking. Freestyle Inline Skating workshop with the legendary Naomi Grigg. World Naked Bike Ride Chicago #6. Kids-n-Kites and other May sights. Green Festival at Navy Pier. El Circo Cheapo Cabaret at Aloft. Wheel Gymnastics National Championships at Circesteem. "Snow Days Chicago Winter Festival" at Grant Park Spirit of Music Garden. Bike Winter Art Show (since 1998) at the Flat Iron Arts Building. Chinese New Years Parade in Chinatown. Annual Dreidel/Santa Rampage bike winter ride. Thanksgiving and Winter Critical Mass. "Homecoming Dance...of DEATH!" at Aloft (Aerial Dance) Loft. Chicago Critical Mass De Los Muertos. "Dr. Egg and the Man with No Ear" at Redmoon Central. "Neon Barbie Fashion Show" at Heat Nightclub in Schaumburg. "Full Moon Carnival" benefit party. 50th Chicago Air and Water Show! Bicycle Film Festival after-party at Cobra Lounge. Northalsted Market Days (since 1982). Redmoon "build day" volunteering on set construction. Clown Week Celebration at Showmen's Rest. Festival Of The Lakes in Hammond IN. "Tour De Fat" in Palmer Square. Before World Naked Bike Ride Chicago (since 2004). During World Naked Bike Ride Chicago (since 2004). After World Naked Bike Ride Chicago (since 2004). LaGrange Pet Parade (since 1947). Chicago Balloon Jam at Merle's in Evanston. Company trip to Niagara Falls NY. "Journey of the Arabella" - A Pirate Circus Play by Forms In Motion. Key Lime Cove Water Resort. CircEsteem Spring Circus at Alternatives. Snow Visions Snow Sculpting Competition in Schaumburg. Tour of Marshall Brodien's fabulous museum of Marshall Brodien history. Gothic Winter Carnival and masquerade with Voltaire at Abbey Pub. Jhonen Vasquez book signing at Chicago Comics. "Ignition 2008" New Years Eve party at Synphorium. Winter Wonderfest at Navy Pier. Christmas and Thanksgiving family scenes. Dulcelandia - Classic mexican style candy mega-store chain. Vaudeville Underground at Monroe School. West Suburban Clown Club winter volunteer events. Chicago Toy and Game Fair (since 2003) at Renaissance Hotel & Convention Center in Schaumburg. Ringling Bros, Barnum & Bailey Circus (since 1871!) at Allstate Arena. "Monster Mash" at Reggie's Live. "Devils Nite - A Date With Debauchery" at Kinetic Playground. Chicago Goth Meetup at Mercury Cafe. Electronic Halloween "Exstabaganza". Local bands impersonate major electronica acts, poorly. Super-special Halloween Nocturna (since 1989) at House of Blues. Midnight Circus performance at Chicagoween in Daley Plaza. Dream Reapers Haunted House, regularly voted "Best haunted House in Illinois" and this editor agrees. Cirque Du Soleil Saltimbanco at Peoria Civic Center. Shopping for Halloween costume parts. Various local clown club meetings. Kids-N-Kites festival on Cricket Hill in Montrose Park, Chicago IL. Wizards Club of Chicago 75th Anniversary Banquet and show at The Diplomat West in Elmhurst. Midnight Circus performing in a neighborhood city park event. Schaumburg High School class of 1997 reunion at Alumni Club. Return To Hogwarts Harry Potter fest. A tiny piece of Estrojam. Good Shepherd Manor fall fest (since 1992). Forest Park Rib Fest (since 2006). Andersonville "Bricolage" mosaic at Bryn Mawr underpass. Giant neighborhood-wide yard sale in Andersonville. "Peter, Paul and Scary" at The Spot. Big Bob Coleman giving an advanced balloon twisting lecture at the Clown Guild of Metropolitan Chicago. Bristol Renaissance Faire near Kenosha WI. Susan stiltwalking at the Majestic Star Casino. "The Fool (Returns to His Chair)" at Neo-Futurarium. Chicago Outdoor Film Festival Tuesdays in summer in Grant Park (since 2000). Chicago Air & Water Show rehearsal. Arlington Park Racetrack Silver Jubilee (25th anniversary). 8th Annual International Clown Week Celebration at Showmen's Rest. Gary Air Show in Indiana. Cool Globes public art installation. "Project Condor" musical robotic mini-blimps at the Broadway Armory. "Cartopia" Annual Art Car Extravaganza (since 2006). River Forest Memorial Day parade. Chicago Critical Mass bike event. Miles for Malawi Fun Run. Cruise Nite in Downtown Earlville. Front Line Assembly at Metro. Smarty Pants balloon art & family dining night at Ranalli's restaurant. Wolff's Flea Market (since 1991) at Allstate Arena. Brief visit to the Museum of Science and Industry. Volunteers of America Katrina relief trip to Louisiana. Face painting and other clowning. Cirque Du Soleil Delerium at United Center. Carson Pirie Scott downtown store closing. Signature Room restaurant (John Hancock 95th floor) and Baton Lounge (female impersonators show). Aunt Josephine's surprise 70th birthday. Fermi National Accelerator Laboratory (Fermilab). Mummers New Years Day performances in Philadelphia. Winter sight-seeing in historic Philadelphia. West Suburban Clown Club winter events. World-class juggler Jay Gilligan at Aloft Aerial Dance. Ringling Bros, Barnum & Bailey Circus (#136, since 1871!) at Allstate Arena. Vaudeville Underground at Glade Memorial Hall. Halloween costume contests at Vision and Nocturna. Midwest Clown Association Roundup (since 1974) at the Radisson Hotel in Northbrook. "Roustabout: The Great Circus Train Wreck" at the Neo-Futurarium. Chicago Air & Water Show. Cirque Du Soleil Corteo at United Center. Shopping at U.S. Toy Company. Blading around the north side. Bacardi party on Blarney Island in Antioch. Chicago Sky games at UIC Pavilion. Showmen's Rest in Woodlawn Cemetery, Forest Park, Illinois). "Extreme Night Out" at Spot 6. Lincoln Park Conservatory, 773/742-7736, 2400 N Stockton. Bristol Renaissance Faire opening day. Nocturna 18th anniversary party at Metro. Club nights at Berlin and Smartbar. Rosenblum's World of Judaica, 800-626-6536, 2906 W Devon. Greater Chicago Jewish Festival (since 1980). Dale's Balloon Jam at Bartolini's Restaurant in Midlothian. Ash's Magic Shop, 773/271-4030, 4955 N Western. Susan's MSW (master of social work) graduation from Dominican University. Easter with family and shopping in Andersonville. Average Saturday at Neo, and circus theme Akira fashion event at Enclave. Kinetic at Spot6 and Nocturna at Metro. Gothic Winter Carnival at Cafe Lura. Lovecore at Peter Jones Gallery. Country line dancing at Cadillac Ranch. Qbot & Kamar Thursdays at Holiday Club. Black Jack Fireworks in Wisconsin. Mars Cheese Castle in Wisconsin. "Stellar Spark 3" new years eve at The Rave in Wisconsin. Illinois Masonic Children's Home holiday party. University Club of Chicago holiday party, Christkindlmarket in Daley Plaza, Marshall Field's decorated windows. State Street Thanksgiving Parade (since 1934). Smattering of Museum of Science and Industry photos. Windy City Con (since 1974) at Wyndham Hotel O'Hare. Cast ("Creature Crew") wrap party for Fright Fest. Fright Fest at Great America. The Cruxshadows at Elbo Room. Glen Oak Zoo in Peoria. Life Without Lupus 5K Walk Run (since 2001). Hellenic American Academy Foundation of Chicagoland Greek Fest. Inkin' Lincoln Tattoo Convention (since 1995) at Holiday Inn O'Hare. Roller Deconstruct at Coachlite Skate Center in Roselle. "Algorhythm" (DJ Tolgar) drum&bass at Lava Lounge. Nocturna and Whiplash at Bottom Lounge. Vernon Hills Arbortheatre outdoor concerts. "Strange and Bizarre" art show closing party at Peter Jones Studio and Gallery. Wizard World comics and collectibles convention at Donald E. Stephens Convention Center. Vernon Hills Aquatic Center "Summer Splash". Sights in Schaumburg and Elk Grove Village. Oak Lawn Family Days (since 1990). Carson and Barnes Circus performance in Melrose Park. "Mark The Knife" Psycho Circus at Exit. Par-King Miniature Golf, 847/634-0333, 21711 Milwaukee, Lincolnshire. "Big Summer Classic" at Alexian Field in Schaumburg. "Fun on 21" Collector Cars shows in Libertyville. Independence day parade in Lyons. Excellent independence day fireworks in Vernon Hills. Maywood Family Education Center "Bridging the Gap" festival. Victito Nocturnis Ball 2 at Abbey Pub. E-Skape in Buffalo Grove Town Center. "Standard" Drum-n-Bass monthly at Liar's Club. "Toss-Up" THE BEST juggling show in the mid-west. Exotic drinking at Hala Kahiki. Goth rummage sale at Exit. Big C Jamboree at Martyrs', Kiddieland. Housewarming at Jason's, Whiplash at Bottom Lounge, and Passover. Gamma Phi Circus at Illinois State University. Scary Lady Sarah party at Club 1041. Pigface "Free For All" tour at Durty Nellies. World Clown Association annual convention in Peoria. National Halloween Costume and Party Trade Show at Rosemont Convention Center. "Eight:18" at Unity Chicago and "Kinetic" at Bottom Lounge. SPAM Sculpture Contest at Gallery Cabaret. Scary Lady Sarah Bloody Valentine party at Club 1041. Sinister Saturday at Club Anything in Milwaukee. Drum-n-Bass monthly at Liar's Club. AGP presents Die Warzau, Acucrack, PTI at Metro. Scary Lady Sarah's New Years Eve party. New Years Eve party at Neo. Vernon Hills Winter Wonderland of Lights. Ed&Jane Bedno's 50th Anniversary Party. Christmas party with old friends in Rogers Park. Christmas party at Mid-Central Printing and Mailing. Holiday party at the Northshore museum of the shocking. Saturnalia (since 2000) at Westgrand Studios. Scorpio party 3 at Transamoeba, 1325 S Wabash. Super-special Halloween Nocturna (since 1989) at Metro. "Devils Night: The Legend of Johnny Velvet Christ"
Stills from The Fifth Element (1997) capturing costume examples. Motorcycle charity event stop at Uncle Paulie's. Exit and Neo w/ Jason. Faith and Andrew's Excellent Adventure #2 (and #1). WE drum tribe harvest moon eve at Northwestern. Redmoon "Sink, Sank, Sunk..." Spectacle at Ping Tom Memorial Park. Friday at Untitled opening in Wicker Park, Liars Club, Exit, Neo. Paradox (et.al.) at Empty Bottle. Neo 25th Anniversary weekend. Chicago's oldest dance club? FINAL "Play :: Drum and Bass Saturday" at Spot6. FINAL "dubFrequency" Drum&Bass Wednesday at Big Wig. Spundae Saturday at Vision Nightclub. "dubFrequency" Drum&Bass Wednesdays at Big Wig. "dubFrequency" Drum&Bass Wednesdays at Big Wig. Also bits of Neo and Spot6 Saturdays. Brockout Reunion drum&bass at Sonotheque. Route 66 themed Skate Rave. Bladers Take Downtown every 1st Friday, 7:30p from Daley Plaza. "Play :: Drum and Bass Saturdays" at Spot6. "Gathering" - All ages Goth night at Chicagoland Community Church. Friday at Exit, Saturday at Neo. Peace Fest at Montrose Park near the Beach. Also Goth beach BBQ nearby. "Star of the Lakeshore" Independence Day parade in Evanston. BassDrive.com BBQ, and Dave's BBQ. 13th annual Bedno/Ritholz cousins reunion. Jason's sampling party, and "Play :: Drum and Bass Saturdays" at Spot6. Nocturna 16th Anniversary Ball at Metro. Cowboys and Indians themed housewarming party. The FIRST World Naked Bike Ride Chicago. Friday at Exit, Saturday Play at Spot6, and Berlin. All ages Goth night at Chicagoland Community Church. Earth Day in Vernon Hills, Brookfield Zoo, and Frances Higgins Memorial. Gothic Council of Chicago Victito Nocturnis Ball at Cafe Lura. Easter and Passover sights, some in Vernon Hills. F.I.R.S.T. Robotics Competition Regionals at NorthWestern University. Chicago anti-war march and rally. "Rhythm" drum club, 1108 W Randolph, 312/492-6100. "Eight:18 - A Circus of the Spirit"
Egostatic, Neptune Crush, others, at The Note. "Contemporary Insanity" Saturday at Neo. Typical after-clubbing at "The Weiner Circle"
Various winter scenes, churches, decoupage, Mexico, snow shoveling video clip. "Dynamite" drum&bass monthly at Sonotheque. "Rhythm" drum club, 1108 W Randolph St, 312/492-6100. First Night Evanston (since 1993). Halloween costume preparation. We are Borg. Woodfield Mall, 847/330-1537, Golf Rd at Route 53, Schaumburg. Vernon Hills Police Department Open House. Al Franken book signing "Lies, and the Lying Liars Who Tell Them"
Kraft employee family picnic at Arlington Park race course. American Flag Tie Dye project. Merz Apothecary, 773/989-0900, 4716 N Lincoln. German-American Fest and Von Steuben German Day parade at Lincoln Square. College of Complexes at the Lincoln Restaurant. DJ KC spinning at "Rotation" Drum&Bass Thursdays. Historic Grosse Point lighthouse in Evanston. Higgins Glass in Riverside and outdoor sculptures in Berwyn. The Melodeers and other choral groups at the North Shore Center for the Performing Arts. Red Bull FlugTag at Monroe Harbor. Late Summer North Suburban Sights, mostly in Vernon Hills. Evil BBQ (since 1997), followed by Whiplash at Spy Bar. DJ (censored) at Neo. An editor fave. Peace Fest at Montrose Park near the Beach. Cynthia and Simin birthdays at Sedition. Solstice and "Contemporary Insanity" Saturdays at Neo. Suburban Harry Potter book release party. Nocturna 15th Anniversary at Metro. Contemporary Insanity Saturdays at Neo. Fridays at "Rhythm" drum club, 1108 W Randolph St, 312/492-6100. Armed Forces Day and Vernon Hills Public Works Department Open House. Final "Beats&Bowling" (since 2000) at Timber Lanes. International Museum of Surgical Science. MST3K Hamlet and Neo Friday. ChicagoFunNews WEEK 300 celebration at "Sedition" Sundays at Joy-Blue. The Ides of March, and the Milwaukee Public Museum. Arable Farmland at Gallery Cabaret. Chicago Jungle, Drum & Bass Old School at Cafe Lura. "Street Scenes" fundraiser at Carmel High School. "Hard Candy" at Big Wig. DJ Droopy birthday bash at Underground Lounge. Christmas Eve at the Nash home. Pointy Teeth at Adidam Center & Bookstore. Catalyst (fem goth DJs) at Underground Lounge. Mouse E. Mouse's funeral. Andrew's birthday. Hot Wheels Roller Rink, 847/566-2590, 139 Seymour Ave, Mundelein IL. Cat Chow "Dressing Objects" at the WONDERFUL Chicago Cultural Center, 312/346-3278 (FINE-ART), 78 E Washington. Redmoon All Hallow's Eve Ritual Celebration (since 1995) at Logan Square. Pre-Halloween party Saturday at Neo, 773/528-2622, 2350 N Clark. Heavyweight headliners "Usual Suspects" spinning at "Rotation" Drum&Bass Thursdays at Cafe Lura, 773/736-3033, 3184 N Milwaukee. Various late summer Vernon Hills sights. Final "Forward" soulful drum&bass Tuesday at Dragonfly Mandarin Lounge, 312/204-9991, 1206 N State. Rosh Hashanah (Jewish New Year #5762) in Highland Park. "Chihuly in the Park: A Garden of Glass"
Berghoff Oktoberfest, "The Wurst Party of the Year", Federal Plaza. Skate Rave, 1st Fridays from Daley Plaza, 7:30p. Earth From Above exhibit in Millennium Park. Redmoon "The Drum Tree", Millennium Park, Downtown. George Clinton and The Guitar Army at the Washburn Guitar Festival in Mundelein. Hawthorn Lanes bowling (847/367-1600) and Zany Brainy (847/816-6156) (both near route 60 route 21) with relatives. "Rotation" Drum&Bass Thursdays at Cafe Lura, 773/736-3033, 3184 N Milwaukee. "Vortex Tower". Aarrowood Pet Cemetery, 847/634-3787, 24090 N Highway 45, Vernon Hills IL. Pier Walk outdoor sculptures and more at Navy Pier, 312/222-9328, 600 E Grand. Chicago Shakespeare Theater, 312/595-5600, 800 E Grand (Navy Pier). Art Wauk VI in Waukegan. Earatik Statik and Monoxide at Cafe Lura, 773/736-3033, 3184 N Milwaukee. Shakespeare on the Green presents Othello at Barat College. Cubs host Philadelphia at Wrigley Field, 773/404-CUBS, 1060 W Addison. Lincoln Square Sidewalk Sale; Lake Forest sights. Vernon Hills "Summer Celebration" American English night. Vernon Hills "Summer Celebration" fireworks night. Putting Edge "glow-in-the-dark" mini-golf, 847/229-8833, In the new "City Park" mall in Lincolnshire. Old West Steakhouse and Donley's Wild West Museum, 815/923-9000, Union IL. Donley's Wild West Town, 815/923-9000, Union IL. Estates: Great Aunt, David Adler. Vernon Hills Independence Day Parade. The WONDROUS Evanston Independence Day parade. Metra, Sears Tower, Farmers Market. Vernon Hills Park District: Aquatic Center (pools, water slide, lazy river), Skate Park, Dearpath Park, and Arbor Theater. Paulette and Marty's new baby, and memories of Pat Olsen. Karma Sutra at Chase Cafe in Rogers Park. Hip-Hop night at Chase Cafe in Rogers Park. The Bandoleros Band at Accent Cafe, 847-298-2233, 700 N River Rd, Mt. Prospect IL. Bass By The Pound's "Seminar". THE Drum&Bass weekly (Wednesdays since 1998), FIRST NIGHT at RedDog, 773/278-1009, 1958 W North. Blues Fest and Shedd Aquarium. Parents Without Partners Lake County Chapter Memorial Day Picnic. Euro Discotheque at Accent Cafe. Afterhourstv.net presents "Naughty Nightie Contest" at Club Nocturnal. Wondrous Suburban sights: Vernon Hills, Mundelein, Libertyville. Some of Andrew's Spectacular Star Trek collection. AC/DC Tribute Band "Downpour at Synergy II in West Chicago. Mega-Moving Sale and Giveaway photos. "Downtown" by Relode at Vision Nightclub. Beki at "Trio" Adult Nightclub, 847/362-1160, 285 Center Drive, Vernon Hills. DJs Andre Solaris, Nosmo, more at Cafe Lura, 773/736-3033, 3184 N Milwaukee. Tesla "Unplugged" at the Vic. War Pigs at Rory's Music Cafe, 630-543-3101, 701 W Lake, Addison IL. Relode "Shattered Thursdays" The Nu induced sound. DJ Freq Nasty (UK). Midwest Wireless Application Developers Special Interest Group meeting at Geneer. Chicagoland Family Pet Show at Arlington Park Racetrack. GEORGE W. BUSH attends Chicago's Saint Patrick's Day parade. Deluxe Lunch with sisters at Deluxe Diner. DJ Nigel Richards at Zentra. DJs Andre Solaris, Dimitry Lovebone, Nosmo at Cafe Lura. Breakdancing Classes and Battles at Chicago's Pilsen YMCA. Downtown Chicago sightseeing including Millennium Park and some classic buildings. Andrew and Kelly on the Spike Manton show. Downtown Theatre District and more. Chicago Music Mart, Harold Washington Library, BrockOut. Waveland Bowl and Fun Zone arcade. Post-Christmas discount shopping at Target and vegetarian lunch at Heartland Cafe. Shopping in Northbrook Court Mall, Nickle City games, my home decorations. Andersonville strolling. Jin Ju Restaurant. Studs Terkel book signing at WomenΧldren First. Elmhurst Art Museum and Lizzadro Museum of Lapidary Art. Andrew's 40th birthday at Berlin. Jean Luc Ponty at House of Blues. Assorted shopping and dining in Andersonville. Spooky Skate Rave (since 1999) and Chicagoween. William Darke's Psycho Circus and Freak show at Double Door. Various Halloween sights. A Taste Of Heaven bakery. Assorted Autumn Sunday bumming around. Sweetest Day, Waking Life at Music Box Theatre, Club 950 reopening. Dinner and shopping in Chicago's ChinaTown. About 2300 South. Francis W. Parker School Centennial celebration and bbq/picnic. Francis W. Parker School class of 1981 reunion dinner. Kites on Cricket Hill and J.C.Penney store closing in Lincolnwood. Native American Pow-Wow in Thatcher Woods. Shopping for Canvas at Vogue Fabrics in Evanston. Saturday night out to Finestra and TMLMTBGB. Local response to the "Attack on America"
"World's Largest" Banana Split. Luther Memorial Church, 773/539-3018, 2500 W Wilson. "World's Largest" yard sale in Andersonville. International Model, Radio Control and Hobby Expo (since 1985). BattleBots stars including Mauler at the International Model, Radio Control and Hobby Expo. "Thought Woven" Gallery show w/ DJs at Supreme. German-American Fest (since 1920) at Lincoln Square, and new SELF SERVICE checkout lanes at Jewel foods. Walker Brothers Original Pancake House in Wilmette. "Gothnic" Annual labor day Gothic bbq/picnic in Montrose park. Block party in Andersonville. Toy rocket launching at Waveland. Shopping for latex body paint in Boystown. Assorted summer photos: Jeff Beck, Elvis weekend, Oyster Fest and more. Chicago Skate Patrol free stopping lessons, and other beach fun. Kids Triathlon (since 1991) at Foster Beach. Air and Water Show (since 1959). Also new BattleBots toys. SandBlast (since 1991) volleyball tournament benefiting American Cancer Society at Montrose beach. Scarlet Life, with "The Personals" and "Lite FM" at Metro. Bass By The Pound's "Seminar" at Big Wig, with headliners Shy FX and MC Skibadee. Also J.Initial and Option at Subterranean. Plus bonus robot and mouse photos. Wonderful Saturday in Des Plaines, including the Choo Choo restaurant (847/391-9815, 600 Lee) where your order is delivered by toy train, Dads Slot Cars (847/298-0688, 700 Lee), and the McDonald's Museum (847/297-5022, 400 N Lee). Wheaton classic car show, every Friday in summer. Spectacular "Skokie Northshore Sculptural Park" on McCormick from Touhy to Dempster. Dining and shopping in Evanston, Asian American fest, new skate park. Dave's Down to Earth Rock Shop, 847/866-7374, 704 Main, Evanston. Evanston Ethnic Arts Fest (since 1986) in Dawes Park, Church street at the lake. Also Davis Street Fish Market. Root at Liar's Club and Sidewalk sale in Andersonville. Lakewood/Balmoral 26th Annual Garden Walk in Edgewater. Also blading around Theatre On The Lake and the new bridge. Thursday in Wicker Park. New Bedno.com Entertainment Information Terminal in Supreme Records (773/862-7043, 1459 N Milwaukee). Also the new MTV Real World Chicago house and area stores. St. Andrew's Greek Festival (since 1962). St. Andrew's Greek Orthodox Church, 773/334-4515, 5649 N Sheridan. "Elements" (N'Joy/Strictly Jungle) drum&bass Fridays in June at Dragon Room (312/751-8700, 809 W Evergreen). Wheaton weekly auto show, Fridays in summer. Independence day block party (Balmoral/Lakewood) with mini-golf in Andersonville. Taste of Daniel. A pre-holiday feast and party at home. Assorted photos by blader Bill. Mostly Friday skate raves. Pier Walk at Navy Pier - Over 100 massive outdoor sculptures on display, one of the city's best civic art accomplishments. A*Mazing Chicago at Navy Pier. A fun little walk though "ride" of sorts, through a series of Chicago themed little thrills. Saturday night FIREWORKS at Navy Pier. Taste Of Chicago - THE big summerly event, throughout Grant Park since 1981. Shopping for robot parts at the OUTSTANDING Andersonville Ace hardware store. Sunday morning at the Chicago Cultural Center, 78 E Washington. Sunday afternoon touring "Suite Home Chicago - An International Exhibition of Urban Street Furniture"
Sunday evening. Urban Dream Capsule at Sears on State. Redmoon performs "Galway's Shadow" at the Museum of Contemporary Art. Gay and Lesbian Pride Parade and Festival (since 1970). Saturday morning at the Lincoln Park Zoo. 773/742-2000, 2200 N Cannon. Saturday afternoon at the Lincoln Park Conservatory. Charybdis defense party at Coyle's Tippling House. Also Father's Day. Artists of the Wall Festival fest in Rogers Park. This year's theme: "2001: A Neighborhood Odyssey". Preliminary trip in preparation for the weekend's Artists of the Wall Festival in Rogers Park. An extraordinary home and collection of spooky things. "Element" (N'Joy/Strictly Jungle) drum&bass Fridays in June at Dragon Room (312/751-8700, 809 W Evergreen). Memorial Day, and summer shopping at the award winning Gethsemane Garden Center (since 1978), 773/878-5915, 5739 N Clark. Diversions Game Room, 773/588-0226, 6259 N Mccormick. A top city arcade, behind the Lincoln Village theaters and Old Country Buffet. Windy City Hemp Fest in Montrose Park. 'Spin Out, a day of tracks, tricks, and trucks.' City sponsored event w/ various popular DJs at the Burnham Skate Park. Also MOTUS at Charybdis. Cinco De Mayo in Andersonville. The Lovely Lincoln Square and Stereo Exchange. MOTUS at Charybdis and Signal Strength at U.S.Beer. Peggy Notebaert Nature Museum on Earth Day. Earth Day Festival near Diversey Harbor. College of Complexes 2500th MEETING!!! Bedno.com THIRD ANNIVERSARY party at Charybdis. Grooverider at Metro. Motus at Charybdis. Motorola Midwest Regional Robotics Competition finals at NorthWestern University. St. Patrick's Day, Chicago Recycle, Toys-R-Us, Rock-N-Roll McDonalds, Rainforest Cafe, First Driving Lesson! O'Hare airport and Root at Liar's Club. Scarlet Life and Taissa Lada at Berlin. Yet another MOTUS Sunday at Charybdis. Mushroom meal, Valentine's Day, Motus/Tron at Charybdis, Root at Liar's Club. THREE CLUBS in one night! Lunacy (Chris Gin) at Crobar, Seminar (Shimon of RAM) at Big Wig, and the grand reopening (Ben Watt) of Smart Bar. Backyard Variety Show at HotHouse. "Babylon Shall Fall" the Final BrockOut at Liar's Club. Stakka and Skynet at BigWig. Fantastic fun North side shopping day. Sunday at Super Just Games. Charybdis Timebomb! New Years Eve/Day party. Charybdis Timebomb! The Annihilation of the Millenium. N'Joy's "Boogie Down 2" rave at Route 66 Roller Rink. Chicago Moving Company's "Rituals of Polite Seduction" at Hamlin Park. KC at Seminar, Berlin, Rainbo. "Signal Strength" drum&bass at U.S. Beer Co.
Andy C at Seminar, Crobar, Redno. Lion and Pollen, Lunacy, low-light photos. City tree lighting, Critical Mass, Chriskindlemarket, Fields windows, Century Landmark theatre in Evanston. St. Morton's Gos Day in Andersonville. Halloween. RedMoon at Logan Square and Nocturna at SmartBar. DieselBoy, Cirrus, Carl Cox, RedMoon, final farmers market. Berlin, Vege Chili, BigWig, Crobar. Meigs Antique Aircraft, Celtic Fest. SoGO Internet Street Fair, Network at Eden, Dion at Berlin, my trashed apartment. Architecture Skate Rave, Usual Suspects at Seminar, Charybdis opening night. Skate Patrol Candy Rave, Sage at Seminar, Brew&View, Tascam244. Konflict at Seminar, Flashback2 rave, Bliss at Insider Art, Tommy Run. Museum of Contemporary Art Summer Solstice. Painted a mural segment in the Artists of the Wall Festival in Rogers Park at the lake. BrockOut at Liar's Club on 2000.06.15, John Digweed at Metro on 2001.06.09, 57th Street Art Fair on 2000.06.05. American Science and Surplus Tent Sale. Last day at DG Systems after five years. Live on the Decks rave pre-party. Friktion, Lords Of Acid, Sage at Seminar. Mohago Eno, Hell, Sherry&Dave, Christmas, Howl, DJ Rap. Birthday BrockOut, Bailey and Storm, Redmoon. Brain Jello, Halloween Skate Rave. Blading, beer and fireworks. Navy Pier. Virtual Skate from Hollywood to Field Museum. Painted a mural segment in the Artists of the Wall Festival in Rogers Park. Sublime 35 second implosion of three CHA buildings early one brisk Saturday morning. AIRSHOW! AIRSHOW! AIRSHOW! Air and Water show (since 1959) at North Avenue Beach. At the Bristol Renaissance Faire in Wisconsin. Other Uncategorized (mostly older) photos. The massive Bedno.com photo+video archive is simply unparalleled. With tens of thousands of photos and hundreds of videos of local events spanning decades, all searchable! Randomly selected photo from the archives. All the coolest local fun. ..-Mo: Sketch Comedy Fest at Stage 773. We: South Park new episode on COM. Th: Drum&Bass night at SmartBar. Ongoing: Rhinoceros Theater Festival at Prop Theatre. Quick reference list of Andrew's favorite annual events. Click on any for details. Browse by periods and categories. Also Jungle, Trance, Techno, Industrial, Glitch, and near relatives. Text only, formatted for simple printing. ChicagoFunNews.com is a comprehensive and concise guide to Chicago entertainment, with a leaning to the offbeat, low cost, and circus/vaudeville arts, online since 1991! Andrew's Chicago area bicycling activities, events, projects, history. Chicago's production of this international annual anti-oil awareness-raising event routinely sets records with nearly 2000 participants. Turnout and safety are facilitated by a strong web presence and email lists built by Andrew. Memorials to cyclists killed by drivers. Locations, photos, notes and links of all Chicago Ghost Bikes. Click a name for details. Wednesday, June 13th 2018, age 41. "Hay un Dias que todo la ve y todo la sabe." Monday, June 5th 2017, age 56. Thursday, January 12th 2017, age 36. Monday, September 26th 2016, age 23. Friday, July 1st 2016, age 25. Friday, June 3th 2016, age 13. Thursday, November 6th 2014, age 78. Friday, October 5th 2012, age 32 "In Loving Memory ~ 9/28/80-10/5/2012 ~ Son. Brother. Friend. Protector. Cyclist." "5-23-53 7-9-03" / "Only the good die young." Jacqueline M. / 25 Forever / "You belong among the wildflowers..."
Sunday, May 8th 2011, age 16. "8.10.94-5.8.11 / FOREVER IN OUR HEARTS"
"Finished God's Race in 24 years." "She heard everyday sounds as music." 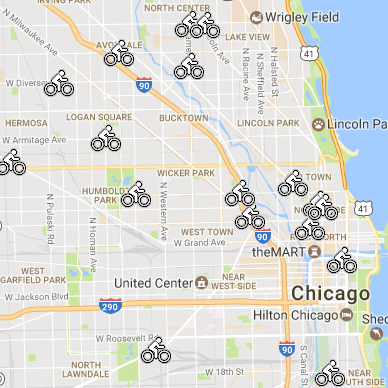 Google Map of all Chicago area ghost bikes with details. Useful online resources related to Chicago Ghost Bikes. Links to bicycle related sites I created, administer, or contribute to. Andrew is a board of directors member for Chicago's leading charitable organization (501c3) promoting "appropriate" transportation. Massive group bike event, the last Friday of each month in cities world-wide, for more than a decade. I didn't create this site but have become one of it's admins. Implemented significant enhancements such as email and sms list join forms, archives, and much content. Hapless innocent casualties with unknowable stories, like puppy bones leashed to a tree. Years ago when I undertook a project of picking a best future bike for myself, one of the best bits of wisdom was being told that eventually I'd own several. Andrew's speech on the inevitable low-car future. Chicago area bike routes by Andrew. The massive Botanic Garden in Glencoe is an easy 14 mile bike ride from Chicago. Andrew Bedno's map of Chicago area barcades, arcades, minigolf and roller skating. Andrew's documenting of an optimized bike route circumnavigating Chicago's perimeter. Based on prior works by John Greenfield. Some accumulated wisdom for development of Chicago Critical Mass routes by a few who have done so. Amazon Wish List of important suggested bicycle accessories, lights, sound, hardware, clothing, etc. Andrew is among Chicago's most infamous inline skaters. Resources for learning this beautifully simple exercise and physical skill. Summer fun, winter fun, full moons and more. Quick Reference to identifying some of Chicago's most common trees. Classic winter documents including lyrics to all common carols and dozens of holiday recipes. The classic Charles Dickens tale. Over 35 holiday classics of every sort. Over 70 holiday classics, arranged alphabetically. Four holiday classics including a Grinch excerpt. Dressing for biking in Chicago in winter. Winter clothing dressup virtual cutout doll. "Camp Envy" is everyone who's watching Burning Man from afar. This is the archive of past weeks of events. Select an issue by date or search the database of tens of thousands of past events. You may already be a member. Every head is a world. I'd like to swing on a star. Always be your better self. Monarchies are soooooo 18th century. I selfie therefore I am. Not all heroes wear pants. A bell cannot be unrung. Don't take the first offer. Booze is proof that God loves us. I've seen the promised land. Hug your loved ones extra tight. We all got a space to fill. My hidden agenda is happiness. Good, Fast or Cheap. Pick two. Two monologues don't make a dialogue. Parties aren't meant to last. We didn't deny Sputnik was up there. What we need is Star Peace. Let the liquor do the thinking. I'll tell you in another life when we are both cats. You can't prove it won't happen. Putting the 'you' back in Utopia. Be the adventure you wish to see. Let That Be Your Last Battlefield. What color is YOUR unicorn? No judgement on the dance floor. Logic is its own reward. Reality, thou art a fickle mistress. We all need a little desperation. Life, liberty, and the pursuit of awesomeness! Thou shalt dig thy neighbor as thou wouldst have them dig thee. Words are weighed, not counted. Oil fuels the war machine. Live your life and be awesome. Don't seek praise, be worthy of it. There is no honor in this. "Please be kinder to one another." Anger is always the shortest distance to a mistake. Five years ahead of my time. Dead is the new 50. No such thing as a fair fight. There can be no interference with the internal development of alien civilizations. All is destiny in hindsight. The world ain't saving itself. Everyone just calm the frak down! Maybe it's the antidepressants, but I'm feeling pretty optimistic. 'Tis the gift to be simple. I've never been more hopeful about our future. Ain't no such thing as a fair fight. Guns have no place in a civilized society. There is no over the top! If you love America RIDE A BIKE!!! There are no old warriors. It's not bragging if you're awesome. If it doesn't hurt it's not real. That which is necessary is legal. WISH IT, WANT IT, DO IT. The only good car is a dead car. Play like you mean it. This was in my prayers. I've tried nothing, and I'm all out of ideas. All is forgiven in two thousand eleven. Turn it up to 2011! We want to be fooled. Up from the ashes of disaster grow the roses of success. Cars are dead. Long live BIKES! Bicycles make the world go around. Welcome, to the world of tomorrow! Set a course for adventure. Program complete, enter when ready. Avoid the unmanageable, manage the unavoidable. New year's resolution: Go car-free. Minds rationalize what bodies wants. Celebrating freedom from oil and beauty of people. Yes is the new No. Memories are meant to fade. I am Joe the Intellectual. I'm not crazy, I'm an ARTIST! "Let your freak flag fly!" Wear your rue with a difference. "Sounds like you're working for your car." More art, with less matter. Gonna lose weight in 2008. Just because you shouldn't doesn't mean you can't. Backwards and in high heels. Your tax dollars hard at war. Clowns are the pegs on which circuses hang. 300 million dollars a day. "Rational Person" is a contradiction of terms. Roses are red, violets are blue, whatever. "Number 1 in the hood, G!" THIS IS THE FIVE HUNDREDTH WEEKLY ISSUE!!! Only 347 shopping days until Christmas. The Future is Full of Glitter! Wake up and smell the popcorn. "Why are all the gorgeous ones homicidal maniacs?" "Some say that Hell is Heaven"
"May Joy And Innocence Prevail"
Do nothing so well as smile. "I've seen the future - I can't afford it." Alarm Clocks are Dream Killers! Thou shalt not be a hater. In God's Eyes Everybody's Hot. La vie est un grand cirque. Going sane in a crazy world. Like a fish without a bicycle. Exorcising the House of Evil. Think yer so smart just 'cause yer so smart?!? Trouble at the Ministry of Truth. My week beats your year. Every turkey dies, not every turkey truly lives. "Anger is more useful than despair." We can do better and we will. FINAL DAYS for voter registration. Final full week for voter registration. "Tis nothing good or bad but thinking makes it so." "They tell me life is beautiful..."
Shock, Anger, Denial, Bargaining, Depression, Acceptance. Let facts be submitted to a candid world. War is SO 20th century. Now is the winter of our content. ME ME ME in 2003! I'm on Spike Manton's show this Monday at 8pm!!!! For Sale - Final Notice! A Great Disturbance In The Force. I send you this newsletter in order for you to have fun! "The Game Is To Be Indigestible"
Chicago Powers Activate! Form of... Summer!!! Fun Fun Fun In Two Thousand and One!!! Do Wheels Still Outnumber Microchips? Celebrate Drum&Bass, Women, and The Irish! Yo Yo Yo - Itz Totally Fresh!!! Be a Hero In Two Triple Zero! We're All On The Same Team! Vote - What's My Age? It's All About The Balance, Baby! Andrew's Chicago Fun Newsletter Rocks!!!! Es La Semana Internacional Del Whacky! Hooray!!! There's Still Half Of Summer Left!!! The Time Has Come For Maxi-Fun!!! Let the inner child be in charge for a while. Can't Swing a Cat Without Hitting a Musician. "Chicago", It's Australian For City! First Ever 100% Hyper-Linked Issue! My Favorite Is Quality and Quantity! Put In a Few Million People, Stir, and Voila! Fun levels off the scale! This week is going supernova!!! Start clearing your schedule for summer! Super-Powers Weakening . . . Must Sleep . . .
New York and L.A. are secretly envious. Yowza! This issue almost writes itself! Sorry to be late, but the dog ate my newsletter. Remember, There's No "I" In "Work". Chicago's Character Is Complex and Subtle, Diverse and Unique. Every day is a holiday this week! Dancing is not a silly focus for a life I tell you. "One of these days you're gonna wake up and realize you've wasted your whole life having fun." Five Foot Walls of Snow. Great Blizzard of Ninety Nine. Still, Fun Prevailed. My, What Celebratory Beings We Are! Can I Still Believe In Santa Please? Jubilation! Chicago and December go together like old friends. I hereby give Super-Ultra-Mega Thanx for the blessings I have received!!! It's the annual city-wide week-long celebration of my birthday!!! Another great week! IN YOUR FACE winter! File Chicago Under "World Class Cities"
I've never seen so much in a week - October's gonna ROCK! Fall Begins This Week, One Of My Four Favorite Seasons. I'm Scared, Someone Told Me Summer Eventually Ends?!?! Can All This Be Happening In One City In One Week!?!? Another great summer week (if you ignore the end of the world heat)! As usual, too much fun for just one week! Summer is really getting rolling! Golly what a week! Glad to be in Chicago. This week has much to offer! This week is gonna be great! Bedno.com (ChicagoFunNews.com) is the work of Andrew Bedno, a comprehensive and concise guide to Chicago fun with a leaning to the offbeat, circus and vaudeville, bike and skate, fests and arts, and little to no cost. Bedno.com features local event listings, unparalleled visual archives and vastly more. Andrew's guide to Chicago and more. WOW! The massive Bedno.com photo+video archive is simply unparalleled. With tens of thousands of photos and hundreds of videos of local events spanning more than a decade, all searchable! Try out new color schemes for this site. Bedno.com is a leader and pioneer in mobile access. Exceptional support for iPhone and others, including VIDEOS! Chicago oldest text messaging group, now numbering hundreds! First to support webphone HDML mini-browsers! ChicagoFunNews.com "kiosk" information terminals were created and deployed as described here through 2000-2003, and positively reviewed by the Illinois Entertainer in 2001. Formats for numerous tiny pocket organizers. Formats for Personal Digital Assistants such as Palm, Windows CE/Mobile, and AvantGo. Virtual narrator and sight impaired formats. Information about this site's Content Management System.